Dennis Williams: "None of us want to blow it." NEW YORK (Reuters) -- UAW President Dennis Williams told Reuters it would be an "injustice" if workers at the Detroit Three automakers don't get a raise in contracts this year, but he said the union must also ensure the companies remain competitive. Williams, in an interview on Thursday with the Reuters editorial board in New York, gave a glimpse of the union's approach to this summer's contract talks with General Motors, Ford Motor Co. and Fiat Chrysler Automobiles. The union wants to sharply narrow the roughly $12-an-hour gap in pay between newly hired and veteran workers, and secure the first increase in hourly base wages for veteran workers in about a decade. Williams left the door open to various ways to address the pay issue, including more variable pay linked to profits. 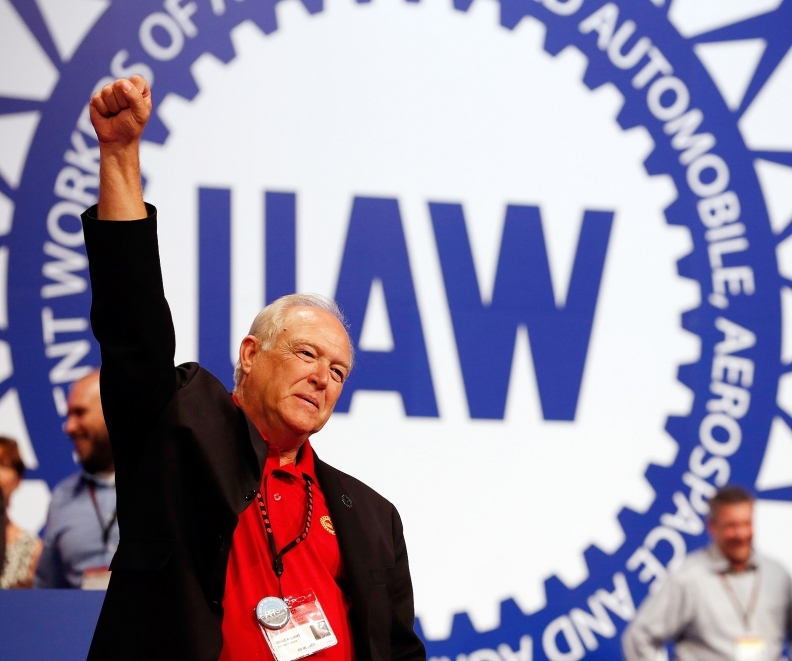 The UAW and the automakers have a lot at stake in this new round of talks. The companies will be punished by investors if they are seen as striking uncompetitive deals in the wake of their near-death just six years ago. Williams must balance the wishes of his members for a big raise, and his concern for the automakers' long-term viability. The UAW has not conducted a substantial strike against any of the Detroit automakers since the 1990s, and was prohibited from striking GM and Chrysler under the terms of the 2009 federal bailout. This time around, Williams said the union is prepared to call for walkouts, if necessary. Other U.S. unions, including workers at oil refineries and West Coast ports, have been emboldened by the strengthening economy to stage strikes or slowdowns as leverage in contract talks. "We're ... mature organizations that have been through a hell of a lot together to survive," Williams said. "None of us want to blow it." Williams, 61, became the head of the richest U.S. union last June, and has said he will serve only a single four-year term. A former U.S. Marine he got his start on the factory floor at farm equipment maker J.I. Case in Rock Island, Ill.
"I'm just a welder," Williams said, before launching into an analysis of corporate balance sheets and the impact of automation on factory workers. Williams serves on the board of commercial truck maker Navistar International Corp., an appointment he says he took reluctantly, reflecting traditional union concerns about getting too close to management. Williams says his views have changed, and he now supports UAW representation on boards. The union has a representative on GM's board. The U.S. government bailouts of GM and Chrysler and Ford's self-funded restructuring have put the UAW in an unusual position. As GM's largest shareholder, and a significant beneficiary of the bailouts, the UAW has a political and institutional stake in promoting the long-term health of the companies. It is still GM's largest shareholder through its retiree healthcare trusts. But the UAW is also under pressure to get the most for its members, especially at a time when more of them, including thousands of auto workers in Michigan, live in "right to work" states where paying union dues is voluntary. The hottest issue in this year's contract talks will be the two-tier pay system that the UAW agreed to in 2007 as the Detroit Three skidded toward crisis. Veteran workers make just over $28 per hour, with slight variations at the three automakers, while entry-level workers make $15.78 to start. Annual raises bring them to a cap of $19.28 per hour. As the U.S. auto market has rebounded since 2009, the Detroit Three have increased the number of hourly jobs by 20 percent to 136,350 UAW workers -- growth the companies and analysts attribute in part to reduced UAW labor costs. But there are significant differences in how the two-tier wage policy operates at each of the three U.S. automakers. Ford recently overtook GM in the number of UAW-represented workers for the first time since the 1930s, and about 28 percent of Ford's 50,700 UAW-represented workers earn the lower base wage rate. GM has 49,900 UAW-represented workers, and slightly less than 20 percent are in the second tier. But at Fiat Chrysler, 42 percent of the company's 35,720 UAW workers are paid at the entry rate. "We've got to be creative," Williams said, referring to any overhaul of the two-tier wage system. "Wages are not the only way to stay competitive. It's about productivity. It's about engineering, it's about a lot of things."